This is the fifth book in the Green Rider Series. I was not sure what to expect in this 5th book in the series. It does not disappoint. The characters are still the ones I love, with new ones added in and some old gone. I love the ghost and it's messages for Karigan. ( Karigan has a special gift of seeing and sometimes communicating with ghosts) I do not want to give anything away so I will try to review without spoilers. 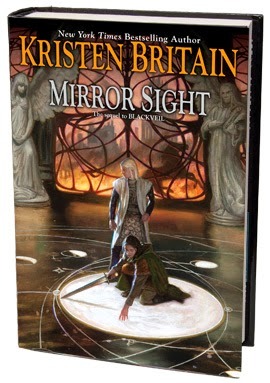 The shattered Mirror mask and Westrion have transported Karigan into the future where she meets some interesting people and learns that she is not the only one from her time in the future. She is tired and injured. She is aided by a professor who takes her in and protects her. She learns very important information from him and his students and he in turn learns about the past from her. Evil is rampant in the future and it seems the only way to stop things from happening Karigan must find her way back to the past. Not everyone wants her to leave. The story is full of new places, and new, well new everything. Since this book is set in a future time expect more modern items in this story. It did not bother me the way it seems to have bothered others. I feel it has given the story line and the characters growth. Something that every series needs in order to continue so that it does not become stagnant. Karigan is maturing, she is no longer a teenager, it should be expected that she will behave more responsibly. She has not lost her fire, her stubborn streak or her backbone. She has gained some wisdom and maturity I for one appreciate that she is growing, as are the other characters. Expect some old characters in a new way, and some new characters in an old way. Be sure to check out the other books in the series first.